I’m finishing-up Einstein: His Life and Universe. It’s a wonderful biography written by Walter Isaacson – the author of Steve Jobs’ biography (another great human being). 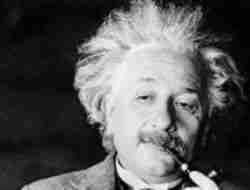 Albert Einstein was a spectacular man, well beyond his mind-boggling, world-changing physics theories and equations. Actually, he was a very dear, sweet man. Oh, he had major problems when it came to understanding and sustaining relationships with those closest to him. But he had a great love for humankind and the wonders of nature. In 1933, Einstein made his home at Princeton, New Jersey – where he was “employed,” if you will, at the Institute for Advanced Study. In very short order, he became a neighborhood legend. Just one of the things that made him so was occasionally helping children and teens with their homework. The story goes that an eight-year-old girl rang Einstein’s doorbell one day, innocently asking for assistance with a math problem. She even brought some homemade fudge as a bribe. Einstein didn’t think twice, saying, “Come in – I’m sure we can solve it.” And though he explained the problem, he made her do the assignment on her own. By the way, Einstein returned the fudge bribe with a cookie. But that wasn’t the end of it, as the girl brought along a friend on her next visit. How did Einstein respond? He invited them up to his very private study! There, he removed piles of papers from his work table, opened several cans of beans, heated them on a Sterno stove, stuck a spoon in them, and served lunch. Is this a good guy, or what? Albert Einstein was no stranger to the plight of those enduring emotional and mental illness. His youngest son Eduard (“Tete,” as his parents called him) was schizophrenic – being institutionalized for most of his adult life. Interestingly enough, Einstein had several encounters with his era-mate in science Sigmund Freud. Like our anonymous friend who offered the opening quotation, you may find yourself stuck in the mire of the journey to the mood and anxiety disorder cure. Yes, it’s that final destination for which you long. But are you willing to accept the fact that your final destination doesn’t exist? That may be horribly difficult to absorb, but I can’t see it any other way. And even if it did exist, how much are you missing in life by not embracing the journey? Look, why not take the counsel of a wise man and take heart and comfort in the preciousness of the search? I mean, he came up with E=mc2. If you ask me, that gives him just a smidge of credibility. I know you’re hurting, but consider a change of destination, won’t you? In fact, go all the way by dropping the destination bit. Just take in the sites along the way for a change. Told you I admire Albert Einstein. Here’s a piece I wrote about him a long time ago. And would you like to read more chipur Feelin’ Better articles? Tap here. Next Post: Overcoming Your Challenges: Let’s Work Together!